Habitat: Greater Plantain is a common garden weed. It can be found on roadsides, grassland, waste and cultivated grounds. Native to Europe. Description: Herbaceous perennial plant. It has oval, erect leaves with sharp apex and smooth margins. Flowers are small and brown, tinged with green, and they grow on a spike like, purple stamen. Flowering period lasts from April to November. Fruiting spike consists of many small, hard fruits. Parts used: Whole herb, fresh or dried. Useful components: Salicylic acid, citric and caffeic acid, mucilage, tannins, proteins, flavonoids, vitamin C, dietary fiber, potassium. 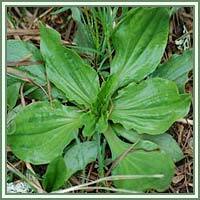 Medicinal use: Greater Plantain shows beneficial results when taken both internally and externally.The plant is considered to be alterative, antiseptic, astringent, diuretic, expectorant, haemostatic, styptic and vulnerary. Due to high concentration of mucilage, plant has excellent emollient properties. The plant is used externally (fresh leaves) in treatment of eczema, burns, cuts, wounds of all sorts, sores, ulcers, insect bites and hemorrhoids. Internally, this is an excellent remedy for gastritis, enteritis, vide variety of respiratory conditions (including bronchitis and asthma). 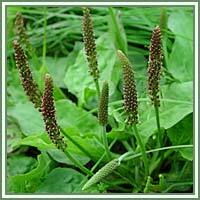 Greater plantain is also used for bladder dysfunctions, jaundice, hepatitis, diarrhea, sciatica, tuberculosis, toothaches, catarrh, hay fever etc. Safety: No known contraindications. Still, some herbs could react with certain medication. Therefore, it is highly advisable to consult your doctor before consumption of any herb.